For generations of American children, attending summer camp has been a time-honored tradition. There are camps focused on a variety of interests – ranging from science-themed camps to adventure-oriented programs, as well as camps focused on sports such as soccer and lacrosse, camps run by the Boy Scouts and Girl Scouts, and those with an emphasis on visual arts and music¹. Some children might not enjoy rock climbing or swimming but would enjoy “the chance to study robotics on a local college campus,” for instance¹. Therefore, it is important to understand your child’s personal preferences before enrolling them in a camp that is best suited to their individual “interests and personalities”¹. Another factor that parents must take into account when selecting the right camp is cost. Overnight camps in particular are expensive, with the average program costing $690 per week, according to the American Camp Association (ACA)². The average day camp costs approximately $304 per week, and may provide a more cost-efficient option. Affordability is one key factor that plays into parents’ camp decisions for their children². Another factor is the number of hours of attendance each day, which also impacts the cost averages. Some camps are only a morning or an afternoon, where others offer a full day experience with early drop off and late pick up. Attending camp has a number of benefits for your child; many experts say that participating in a summer camp program “lets kids roam and play in a way that they rarely do in their own neighborhoods these days,” with the advent of technological distractions such as TV, computers, and mobile devices such as smartphones and tablets³. Rather than being glued to a screen, children attending camp enjoy “conversation, fun and games in a natural setting” without their parents’ presence³. Furthermore, summer camps allow children to gain a degree of independence. Peg Smith, CEO of the American Camp Association, says, “Kids have to learn how to separate from their families and become resilient and independent. Camp gives them a safe way to take these steps”³. Acknowledging the importance of quality summer programs designed with participants’ tastes and preferences in mind, Ramapo College of New Jersey’s Center for Innovative and Professional Learning (CIPL) offers a variety of stimulating academic camps for middle and high school students that also provide for opportunities to test new topics that can expand students’ interests during the summer. At Ramapo, there are two camps available for middle school students as part of the Ramapo Explorers-STEAM program: one is a Theater Camp, and the other is a STEM Camp integrating principles of science, technology, engineering, and mathematics. (STEM). For high school students, there are numerous programs including: Art Portfolio Preparation, Brazilian percussion Percussion, CompTIA A+, Financial Literacy/Stock Market Trading, Game Design, Numerical Analysis, Programming/Data Science, a 3-credit online Web Site Development course, and several theater arts classes from Acting to Costume Design to Make-up for Stage & Screen, to Improvisation and Voice & Movement for Actors. 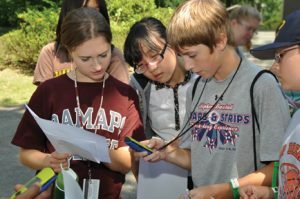 To learn more about summer camps and programs for middle school and high school students at Ramapo College, or to sign up for an upcoming Information Session, visit www.ramapo.edu/ramapocamps for more information. ¹Source: MoneyTalks News. “7 Tips to Find an Awesome – and Affordable – Summer Camp” by Maryalene Laponsie. Retrieved from http://www.moneytalksnews.com/7-tips-find-awesome-and-affordable-summer-camp. ²Source: Care.com. “What Does Summer Camp Cost?” by Alexandra Kadlec. Retrieved from http://www.care.com/c/stories/3326/what-does-summer-camp-cost. ³Source: Parenting. “How to Pick the Right Summer Camp for Kids” by Barbara Rowley. Retrieved from http://www.parenting.com/article/summer-camp-kids.